This vegan lentil dip is a perfect treat for those who want a clean and healthy sandwich spread recipe without compromising the taste of their meal. Grab my new high fiber recipe or watch my short video below. Don’t judge this sandwich spread by its appearance. I’m aware that it wouldn’t win any “beauty contest”. But liver sausage on the other hand also never looked very appealing to me and yet it was one of my favorite spreads in my early childhood. The more health conscious I got over the years the less liver sausage I ate and in the end, I totally forgot about it. I think I never served liver sausage to my own little family. But before I explain what my “Leberwurst” story has to do with lentil spread let me first present the lentil spread recipe to you. a hearty and healthy sandwich spread for a quick weeknight dinner. Works great also as school or work lunch. Thin out according to your preferences with the remaining olive oil and broth of the lentils. The spread should be very smooth, if it is pasty or dry, add more broth or olive oil. Fill it in glass jars and store it in your fridge for up to 1 week. To save even more time you could try this sandwich spread recipe with red lentils too. They don’t need to be soaked and are cooked within 15 minutes. What has my “Leberwurst” story to do with the lentil dip recipe? I love to experiment with different sandwich spread and dip recipes and I always wanted to try out a lentil spread. Given the fact that my vegetarian daughter more and more tends towards “vegan” options, I felt the urge to try out a vegan spread we could all love. My family adores my lentil soup and any other lentil dishes I’ve cooked so far, so I assumed that a lentil cream could maybe work too? This clean eating recipe took me a bit longer to prepare than expected as I had only brown lentils at hand and I forgot to let them soak overnight. But if you follow my tips below you can save some time on this spread recipe. I prepared this legume spread on the last weekend and I experienced a real taste revelation – who would have thought? To my surprise, this lentil spread not only looked like liver sausage but combined with slices of my homemade whole wheat bread it also tasted a bit like hearty liver pâté. In my opinion, you could never have too many healthy protein sources in your clean eating kitchen. 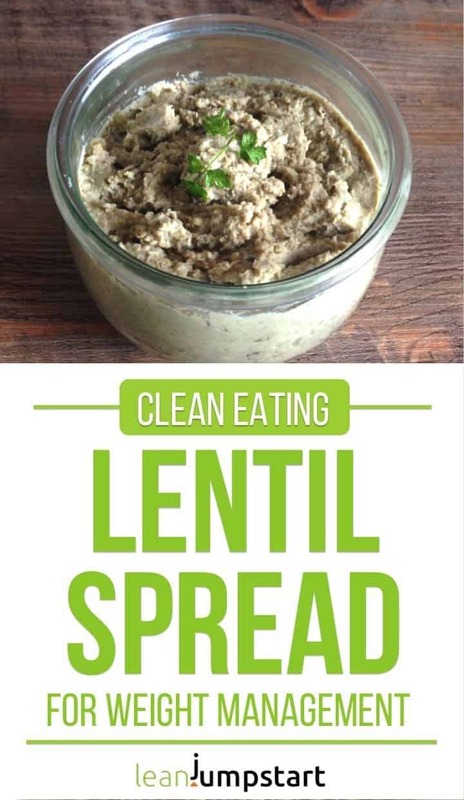 This lentil dip has a sustainable level of calories and it is rich in nutrients – an excellent clean eating sandwich spread for all those of us who watch their diet. On top of that lentils are high fiber foods and we all know how important dietary fiber is for best health and weight management. By the way, it can also be used as a yummy dip variation on parties. Do you love healthy, yummy spreads with just a few ingredients? Then you shouldn’t miss my 52 Chef Habits Ecourse. Clean eating spreads are an integral part of the 52 Chef Habits.